This was a residential (Class 3 | Cat 3) water loss that originated from a sewage backflow (foreign debris fill-up). The home was built in 1945 and constructed on a concrete slab on grade. The back flow was created as a result of a child flushing a toy down a toilet which closed off the sewer line, causing the drain system to fill up when other plumbing fixtures were used in the home. The homeowners turned on the washing machine when they left for the day and returned to a flood inches high inside their home. During mitigation, all affected materials were removed. 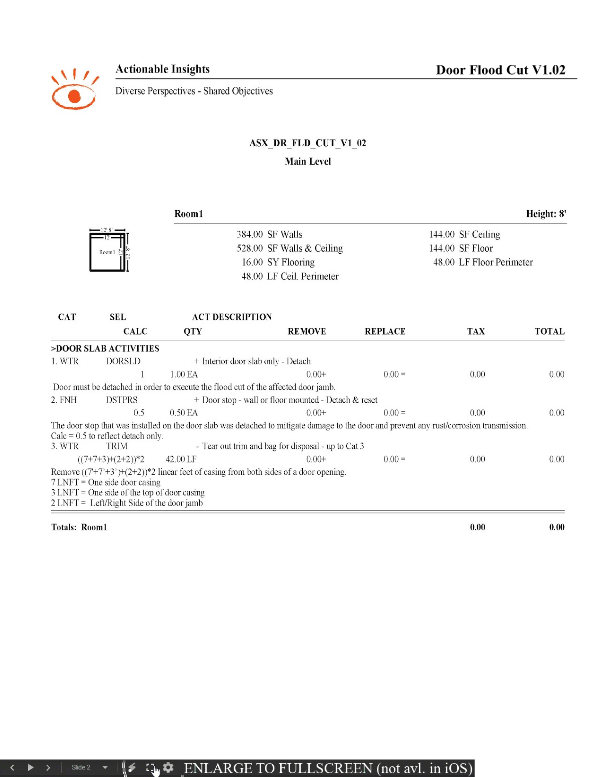 This Insight Sheet exists to clarify how one might invoice for cutting the bottom of a door jamb. This does not seek to include or make concessions for all equipment and/or activities as it relates to a loss of this nature. Hi Joe! Not in this specific instance as the Loss Snapshot (description of what happened to cause the loss) wouldn't have called for those activities. I will add them to the Situationally Relevant slide at the end of the Insight Sheet. Thank you! Hi Joe - Knobs and Hinge detach and reset line items have been added to Situationally Relevant. Thank you for your feedback!